In order to do driver setup properly, you should know what it does and how it should fit into your data distribution plan. For an overview of the driver functions, see OckamSoft 5 Driver. The driver needs to run in order to convert serial data into the UDP broadcast for use by Race/Vysion and Expedition. 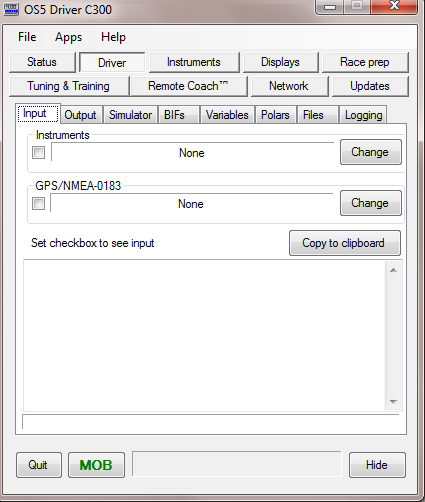 The instrument system connects to the driver over a serial port. The driver does not need to run in order to use Race/Vysion or Expedition. If more than a single application on the same machine requires instrument data, the driver must run in order to provide UDP ‘clones’ and/or the TCPhook for these applications. In this case, the driver gets the primary UDP port from the LANbridge, and creates duplicate(s) for the application(s). Instrument data enters the driver thru a serial port and is output over Ethernet in two forms, and on a virtual serial port (vPort) for another legacy serial input application on the same PC. The UDP broadcast is a flexible and simple protocol for distributing data. It carries instrument, GPS and other data streams at the same time. Because of operating system limitations, only one application on any given machine can open the UDP broadcast on a given port. However, the driver can create clones on different ports that will allow multiple applications on the same machine to use it.